In what is being called a "landmark" ruling, Canada's top court has ruled that tens of thousands of Métis and non-status Indians are now under the jurisdiction of the federal government, ending a 17-year court battle. Canada's top court has ruled that tens of thousands of Métis and non-status Indians are now under the jurisdiction of the federal government, in a decision that the prime minister says will have "broad consequences and impacts." "This is a great day for over 600,000 Métis and non-status Indians," said Dwight Dorey, national chief of the Congress of Aboriginal Peoples, after the Supreme Court of Canada decision was released Thursday, ending a 17-year battle. "Now hopefully we will not have to wait any longer to sit at the table." In the unanimous ruling, which may serve now as a starting point for those pursuing land claims and additional government services, the court held that non-status Indians and Métis are considered "Indians" under Section 91(24) of the 1867 Constitutional Act. "This is a landmark ruling that will have broad consequences and impacts," said Prime Minister Justin Trudeau, adding that the government will need to study what those impacts might be. "But I can guarantee you one thing: The path forward will be together as we move forward." The ruling extends the federal government's responsibilities to approximately 200,000 Métis and 400,000 non-status aboriginal people who are not affiliated with specific reserves. Bruce Dumont, president of the B.C. 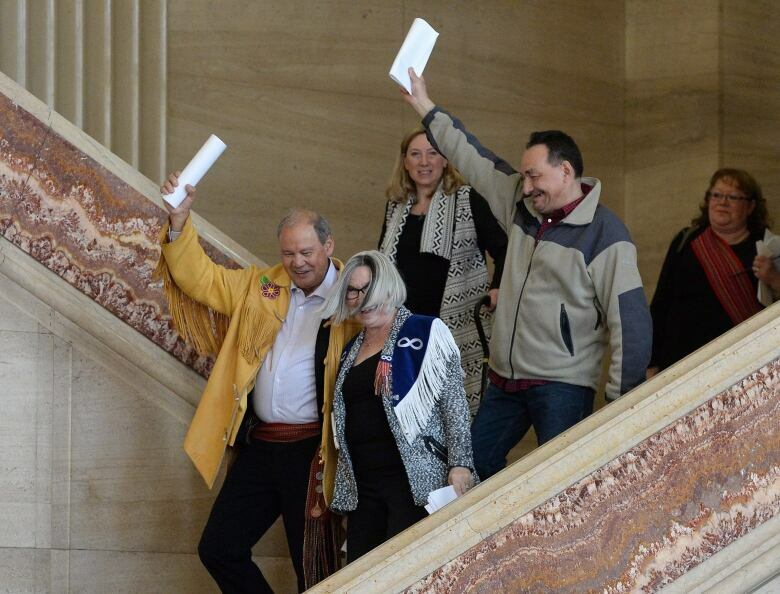 Métis Nation, left, Audrey Poitras, president of the Alberta Métis Nation, front, and Gerald Morin, vice-president of the Saskatchewan Métis Nation, right, celebrate the Supreme Court of Canada decision. (Sean Kilpatrick/THE CANADIAN PRESS)Without this clarity, indigenous communities were in a "jurisdictional wasteland with significant and obvious disadvantaging consequences," the ruling said. The result of this "political football" was that financially, Métis and non-status Indians were deprived of significant funding for programs, services and other benefits. "I'm very happy that we were successful in removing a blockage," said Joseph E. Magnet, lead lawyer for the Congress of Aboriginal Peoples. "The court recognized that this blockage has caused significant disadvantage, discrimination, and resulted in denial of programs and services that all governments recognized were necessary." "This is a dream come true," said Gail Gallupe, president of McMurray Métis Local 1935. The group represents Métis people in Fort McMurray and northeastern Alberta. Jason Madden is a Métis lawyer with Pape Salter Telleit, a firm specializing in Métis and First Nations law. He calls Thursday's decision a "1,2,3 punch" that affirms the government has jurisdiction over, a fiduciary responsibility to and the duty to negotiate with Métis and non-status peoples. "It's about certainty and accountability," he said. "Without the certainty, government gets to play games and duck and deny. "We believe that now we can move forward; now there is no jurisdictional barrier," said Clément Chartier, president of the Métis National Council. `[Government] cannot say, 'Well we can't deal with you because Section 91 (24) doesn't include you.' This of course strengthens our position." A broad interpretation that includes all aboriginal people. A narrow meaning to distinguish First Nations from other groups. For the purpose of defining federal jurisdiction, the broad meaning applies. However, the ruling also does not distinguish which communities are Métis and which are non-status Indians. Determining whether particular individuals are non-status Indians or Métis — or exactly who this ruling now applies to — is a "fact-driven question to be decided on a case-by-case basis in the future." What does it mean to be Métis? "There is no consensus on who is considered Métis or a non-status Indian, nor need there be. Cultural and ethnic labels do not lend themselves to neat boundaries," the ruling said. "Which is good," Madden`said. "Those issues are best left for the communities themselves to answer." The landmark case was launched in 1999 by prominent Métis leader Harry Daniels — then president of the Congress of Aboriginal Peoples — along with Leah Gardner, a non-status Anishinaabe woman, and Terry Joudrey, a non-status Mi'kmaq man. Daniels died in 2004. 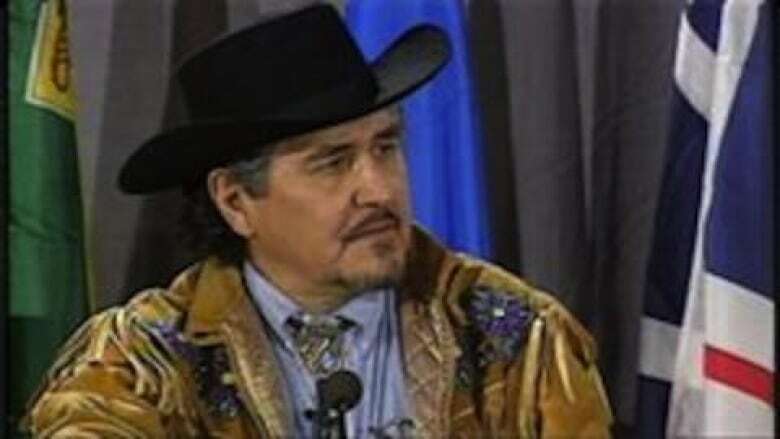 In 1999, prominent Métis leader Harry Daniels started the landmark Métis and non-status Indian rights case. Daniels died in 2004. (Métis Council of Prince Edward Island)"I'm overwhelmed and ecstatic, and I wish my father were here to see this," said Gabriel Daniels outside the court. "He'd probably do a jig right now." The case, known as Daniels vs. Canada, went to trial in 2011 and final arguments were heard in 2015. Canada's top court was asked to rule on whether the federal government has the same responsibility to Métis and non-status Indians as to status Indians and Inuit. Duane Morrisseau-Beck was one of about 100 people in the foyer of the Supreme Court when the decision was released. "You should have seen the energy in this room go from zero to a hundred," said the Métis man who lives in Ottawa, although most of his family are still in Manitoba. "The Métis leadership came walking down the hall, screaming, you could hear it." Morrisseau-Beck said his mother was overcome with emotion after learning of the decision. "I guess it's just relief and happiness," he said. "She wants to know who the judges are so she can thank them." Morrisseau-Beck said he still doesn't know exactly what the decision means, but hopes it leads to land claims for Métis communities and increased services. He also calls it a validation of Métis rights and history.